The National Retail Federation (NRF) has been conducting its annual Independence Day survey since 2003 to see how Americans will celebrate the 4th of July holiday. And this year, warm weather and a patriotic spirit will contribute to an increase in spending. 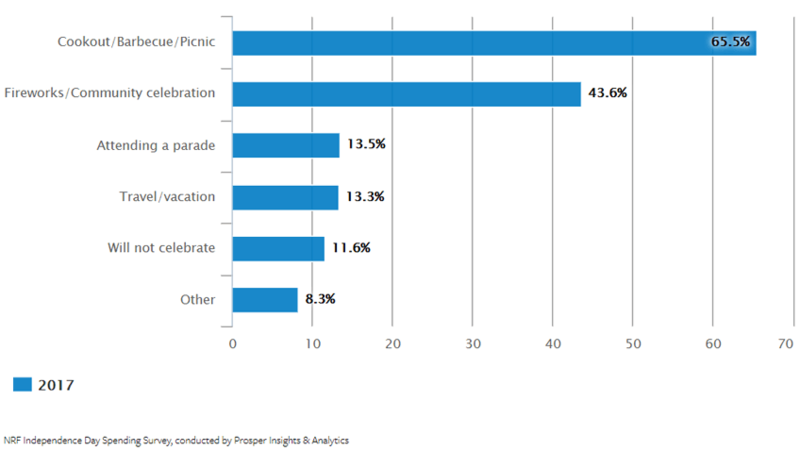 Americans are expected to spend $7.1 billion on food for cookouts and picnics as they celebrate the 4th tomorrow, up from $6.8 billion in 2016, according to the annual survey released by NRF and conducted by Prosper Insight & Analytics. This year, NRF says that over 219 million Americans will celebrate Independence Day, with 162 million planning to partake in a cookout or picnic, spending an average of $73.42 per person – up from $71.34 in 2016. Additionally, Americans will be busy attending fireworks shows and parades, or traveling to their vacation destination, while the survey found that 11% of those interviewed will not celebrate the 4th at all. The holiday weekend is a popular time for travel, and an estimated 44.2 million Americans will travel 50 miles or more between Friday, June 30th and Tuesday, July 4th – and according to AAA, 37.5 million of those traveling will be driving. The likely first stop for these travels will be the gas station. The Friday of Independence Day weekend is the biggest day for buying gas, with spending up 27% compared to the daily average in July, according to Bank of America. Fuel prices have been declining over the past month due to seasonal trends and the falling price of crude, said Patrick DeHaan, a senior petroleum analyst for GasBuddy.com. Nationwide, the average price for a gallon of gas is $2.28, and drivers are likely to see gas prices decline further as the holiday approaches. Only 18% of those surveyed by NRF say the price of gasoline will affect their plans, down from 21% last year and a record low since the survey began in 2004. The number who said high gas prices would discourage them from spending for Independence Day peaked at 59% in 2008. Although the survey found that 65% of consumers already own a U.S. flag, 53% owned patriotic-themed apparel – t-shirts, swim suits, shoes – and 40% own patriotic decorations, 28% still plan on purchasing more American-themed items to celebrate the holiday. Do you plan to purchase patriotic merchandise within the next 30 days? Retailers are waiting for those last-minute consumer purchases, and stores that once kept their doors closed over the 4th of July are now using the holiday as a means to sell their goods by promoting Independence Day sales. SavingAdvice.com offers a list of stores that will be open over the holiday, while dealnews.com provides a sales rundown of where consumers can find the best deals – proving that retail is still alive and kicking on the 4th. Whether buying roadside fireworks or hotdogs for the grill, today’s retailers and consumers know that the threat of a data breach is real. Within the past few years, the vulnerabilities of retail point of sale (POS) systems were exposed through several high-profile data breaches. These breaches have cost companies hundreds of millions of dollars and rocked consumer confidence. 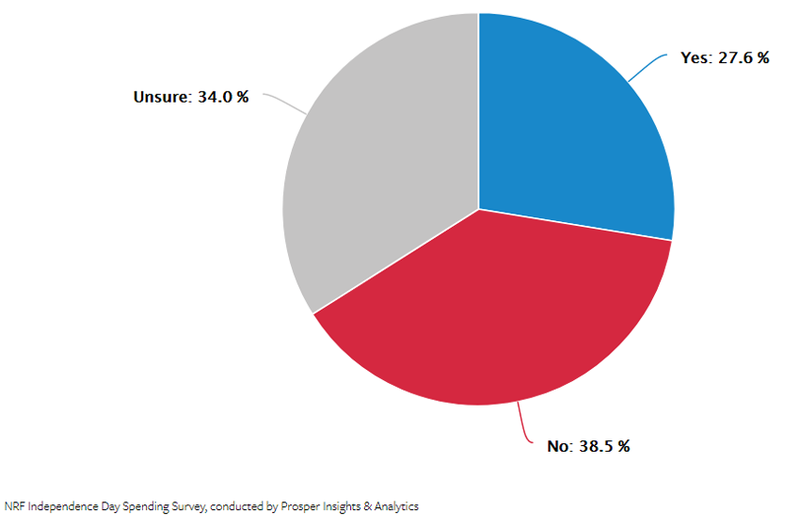 In a large percentage of breach cases, malware was the culprit, infiltrating the retail system and stealing clear-text cardholder data to be later sold on the black market. In 2016, there were 1,093 recorded data breaches involving more than 35 million consumer records. Large and small corporations fell victim to fraudsters who infiltrated POS systems and stole clear-text cardholder data. Bluefin provides retailers a “devalue the data” approach to card security. By implementing Bluefin’s PCI P2PE products to encrypt cardholder data at the point of entry, clear-text cardholder data is prevented from being present in a merchant or enterprise’s system or network where it could be accessible in the event of a data breach – rendering the date useless to fraudsters. Learn more about NRF and Bluefin, and Happy Birthday America!